BMW has made large steps in producing solar-powered cars for consumers, culminating in the release of their i3 all-electric car last year, alongside the upcoming i8 plug-in hybrid vehicle. 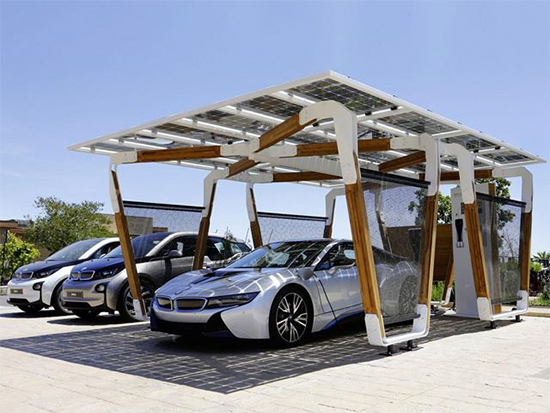 BMW has now shown off a brand-new carport designed specifically for the use of solar-powered cars. 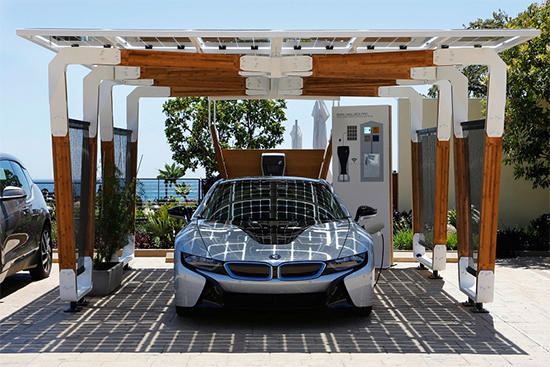 The port takes advantage of glass-on-glass solar panel modules in order to generate clean electricity for the vehicle, and the structure uses fast-growing bamboo, carbon fiber reinforced plastic, and steel to support a glass roof containing solar panels. The port, which will display different information about the amount of solar energy available through user interfaces, will even allow users to use the solar energy for their home. The i8, which will have a range of 22 miles in all-electric mode, will release in September, and will easily interface with the new carport, making the entire process a smooth transition for new drivers.